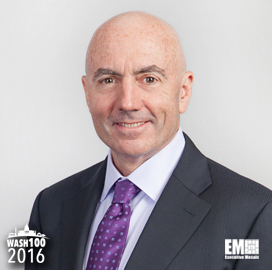 Executive Mosaic is pleased to introduce Mark Testoni, president and CEO of SAP National Security Services, for the second consecutive year, as an inductee into the 2016 edition of the Wash100 — Executive Mosaic’s annual selection of influential leaders in the government contracting arena. In this capacity, Testoni oversees sales, go-to-market strategy, management, product support and consulting operations of the subsidiary that does business as SAP NS2. At the 2015 SAP NS2 Solutions Summit, he advocated for an increased focus on the role of individuals in national security missions. “Technology in the cyber realm is rapidly advancing to stay ahead of evolving threats, and though we’ve made progress in that department, we often overlook the human element, the most critical aspect of our security,” Testoni said. In a November 2015 interview, he told Federal Times that cyber warfare has become “another dimension of conflict” and that the U.S. needs to secure critical infrastructures from potential cyber attacks. Testoni also discussed in an interview with Signal magazine about the potential of behavioral biometrics to detect potential network vulnerabilities. “We’re hoping to use people’s behavior patterns and what they do inside of the networks to help us identify potential threats,” he added. In August 2015, SAP NS2 shifted the focus of its training program for veterans to analytics in order to meet the increasing demand for analytical skills. The NS2 Serves-run training program also aims to leverage “those good skill sets that they get in the military and [adds] an important technical skill on top that would allow more employability,” Testoni told FCW. Prior to SAP NS2, he previously served as president of the SAP Public Services business. Before he moved to SAP, Testoni worked at Oracle for over nine years and led the software firm’s application business within the Defense Department. He is a 20-year U.S. Air Force veteran and held roles in the area of logistics, information technology and financial management during his military career. Executive Mosaic congratulates Mark Testoni and the SAP team for their selection to receive this award.